One site for two great ways of unleashing your dog’s true potential. As the only Certified Canine Fitness Program between Portland and Seattle, Dogs in Action is designed to unleash the true potential of your dog’s body and mind. Our safe, innovative and effective training methods provide the physical exercise and mental stimulation your dog needs to be healthy and happy – in as little as 15 minutes a day. Keeping young dogs healthy and injury-free. Canine athletes who need to stay in peak physical condition. Curbing common behavioral issues stemming from boredom or a lack of exercise. Pudgy pooches who need to shed a few pounds. Busy pet owners with limited time to exercise and train their dogs. Senior or special needs dogs, or those recovering from injury. Anyone who loves finding fun, new ways to spend quality time with their best friend. You’ll be amazed how quickly your dog’s fitness improves, how rapidly he learns and how much fun you both have along the way! With 30 years’ experience providing animal-assisted interactions (AAI) and training dogs and their volunteer or professional handlers, Human-Animal Solutions is THE therapy dog resource. Ann Howie has both the experience and the compassion to help you meet your AAI goals from professional consultation regarding AAI program development and enhancement, to private lessons for therapy dog training, to classes for volunteer handlers and human-services professionals. We come when called – locally and internationally! Ann R. Howie, the founder of Dogs in Action, is a Certified Canine Fitness Trainer (CCFT) who is passionate about enhancing the well being of dogs and their people. For more than three decades, she has worked with both humans and dogs in a variety of ways – from animal-assisted therapy to professional dog training to canine wellness. 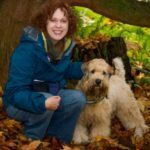 With a sense of humor, a calm demeanor and lots of encouragement, Ann shows her clients how to live healthier, happier lives with their canine companions. “My Pomeranian, Bubba, had recovered from knee surgery and needed some exercises to help him improve his mobility. Ann gave me the guidance, knowledge and exercises to help Bubba on a great road to recovery.” – Julie C.